"In in my day, we had to walk a mile to school - uphill, both ways." There may be some truth - and a lesson - to that old joke. 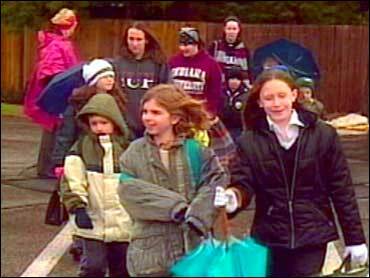 Today, only 13 percent of kids walk to school, down from 66 percent 30 years ago. there's an effort afoot to bring those days back. Mornings at the Wilson house in Indiana, Pa., are like clockwork as Valerie Wilson wakes up her kids. Sometimes, the clock is a little slow as there usually is a sleepyhead in the household. Eventually, the kids are up and dressed, breakfast is made, lunches packed and they're off. But instead of getting on the bus, Sam and Becky Wilson are the bus, part of what's called "a walking school bus," a group of kids and adults who go to school together every day on foot. Valerie Wilson says, "I know that they're walking with an adult. So I feel safer that way. I don't worry about them at all. Otherwise, I might worry." In this case, the adults are college kids who volunteer to guide the "bus" to school: there's a "driver" who walks in the middle of the group and tells the kids which way to go, and a "caboose" in the rear, looking for stragglers. Becky notes, "There's always stragglers!" The "bus" stops at each house and runs in almost any weather, although, Valerie Wilson makes one humane exception. She says, "If its less than 20 degrees, I take them. But other than that, they pretty much walk in the snow. If it's 21 degrees, they're out there!" On the day Smith joined them, it was 41 degrees and raining. No one was complaining, except Smith. "Why not get in a car? It's disgusting out," Smith asked a kid. The reply: "It's boring in a car." For the kids, it's a chance to socialize and splash through the occasional puddle. For parents, it's a way to get out of the house and get moving. Valerie Wilson says, "I'm guaranteed my kids are walking close to a mile every day. And that's important to me because, particularly in the winter when they're not in a lot of sport-related things, I know they're getting exercise." Eventually, it might relieve traffic congestion around the school. But for now, the program's pretty small: only about 40 kids out of 700 participate. Valerie Wilson points out, "It's a lifestyle change. People are more inclined to get in their cars and drive five blocks than they are to put on a coat and walk five blocks." But if Sam and Becky Wilson are any indication, the next generation is already convinced. Sam was asked what he would do if mom suddenly said tomorrow, 'Oh, you have to get on the bus and go to school' or 'I'm going to drive you to school.' Sam says, "Tomorrow? Tomorrow is the best day to walk. So I would say,'Sorry. I'm walking!'" The program costs only about $200 a year to run. And organizers say it can work as well in a big city as it does in a small town like Indiana. In fact, there's a very active walking school bus program in Chicago, where 90 percent of kids walk to school.